Having a baby is one of the most precious moments in a parent’s life. Nothing can compare to the excitement and joy felt when a couple realizes they are about to give birth. Pregnancy alone is tough. It’s filled with emotion and worry. Every parent-to-be worries about the health and well-being of both the mom and the baby. So many natural things can go wrong with a pregnancy, as we all know. But what if an injury occurs during the birthing process that could have been prevented? We all trust that our doctors are responsible individuals who always make the right decisions when it comes to our health. Unfortunately, in some instances, this is not the case. Some doctors are negligent when performing their regular duties and the baby and/or the mother suffers. Birth injuries can be caused during a pregnancy or during labor and delivery. Birth injuries and defects often occur during traumatic deliveries, especially when the mother has medical issues. But not all birth injuries are caused by natural issues. Medical negligence such as failure to give oxygen to the baby, delayed C-section and the administration of improper drugs (during pregnancy or during delivery) can cause serious, if not deadly, harm to a newborn. In situations where a medical error has been made by a health care professional during pregnancy, or labor and delivery, the result can be devastating birth injuries. In many cases, if the doctor had been more attentive to signs and signals, or followed proper procedures and taken the necessary corrective action, there is a chance the injury could have been prevented. Specific errors include misuse of forceps, untimely delivery, failing to conduct a C-section in a timely manner, and improper fetal heart monitoring. What are some signs your child has suffered a birth injury? Birth injuries can lead to brain damage, Cerebral palsy and even death. If your child has suffered any of the above-mentioned issues, it’s important to seek immediate medical attention. Also, get as much medical documentation of your case as possible. Documentation could help if a lawsuit is brought against the negligent parties, as medical negligence cases are often very complex and tough to prove. Birth injuries can have severe, life-altering effects on the child, mother and family. Medical bills, financial loss, and a lifetime of pain, suffering and possible disfigurement should all be compensated if a health care provider’s negligence is to blame. It’s important to know that there are deadlines (which vary by state) to filing medical negligence lawsuits, and collecting medical records and other pertinent documentation can take some time, so it’s important that you consult with a Miami birth injury attorney as soon as possible. If you suspect your child sustained a birth injury due to a health care professional’s negligence, speaking with an experienced attorney is the best way to get answers. 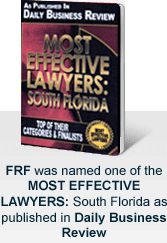 At the South Florida law offices of Friedman, Rodman & Frank, P.A., we can talk with you about your situation. If we believe that you may have a case, we will conduct a thorough investigation. To discuss your options with an experienced Miami medical negligence trial lawyer, call us at 305-448-8585 or toll free at 877-448-8585 or contact us online.